Endothelial function is dependent on the generation of nitric oxide (NO) by the enzyme endothelial NO synthase (eNOS). One functional coding polymorphism of the eNOS gene (G894→T) is associated with reduced enzyme activity, increased coronary heart disease, and the development of end-stage renal failure. Because gender and renin-angiotensin system activation also play key roles in the development of renal and cardiovascular disease and because NO plays a role in the response to angiotensin II (AngII), it was hypothesized that the eNOS gene G894→T polymorphism would be a determinant of the systemic and renal vascular response to AngII. Fifty young, healthy, normotensive individuals who were on a controlled sodium and protein diet for 1 wk underwent assessment of BP and renal hemodynamic function at baseline and during AngII infusion (4 ng/kg per min for 45 min). Participants were genotyped for the eNOS gene G894→T polymorphism and then segregated into groups on the basis of gender and genotype (GG versus GT/TT). Baseline values for renal blood flow, effective renal plasma flow, and GFR were lower in men with the T allele compared with men who were homozygous for the G allele (P = 0.03), but the polymorphism was not associated with renal hemodynamic function in women. The BP responses to AngII were similar in men and women regardless of genotype. Both multivariate linear regression and analysis of covariance (ANCOVA) revealed a relationship between gender and genotype. Men with the GT/TT genotype exhibited a significantly greater decrease in GFR (P = 0.04) in response to AngII than did those with the GG genotype. This association was not observed in women. The eNOS gene G894→T polymorphism is a determinant of both baseline renal hemodynamic function and the hemodynamic response to AngII in men but not in women. Endothelial function is an important determinant of cardiovascular health, and endothelium-dependent vasodilation is mediated by the local production of nitric oxide (NO) (1), synthesized from l-arginine by the enzyme endothelial NO synthase (eNOS). Several polymorphisms of the eNOS gene have been reported (2). One eNOS gene polymorphism, a G to T substitution at position 894 (G894→T), leads to a change from aspartate to glutamate in the eNOS protein, and some studies suggest that this molecular variant is more susceptible to proteolytic cleavage (3–6). The eNOS gene G894→T variant has also been associated with a dose-dependent reduction in enzymatic activity and basal endothelial NO production (7–9). In addition, numerous studies have reported that endothelium-dependent vasodilation is impaired, both at rest and after the administration of vasodilators, in individuals with the eNOS 894T allele (10–12). Diminished endothelium-dependent vasodilation is known to occur in a variety of disorders of vascular function, where it may both precede the gross appearance of atherosclerotic lesions and predict future cardiac events (13). In this regard, the G894→T allele has also been associated with ischemic heart disease, hypertension, carotid atherosclerosis, and diabetic nephropathy (14–17). Angiotensin II (AngII) is a potent vasoconstrictor and the principal effector of the renin-angiotensin system (RAS). Activation of the RAS has been linked to glomerulosclerosis and the progression of chronic renal disease (18). Although vascular tone is a balance between vasoconstrictor and vasodilator influences, the effect of the functional eNOS gene G894→T polymorphism on the systemic and renal hemodynamic response to AngII has not been studied. Gender is known to modulate RAS activity, and the hemodynamic response to AngII was shown to be a function of both gender and a polymorphism of the AngII type 1 receptor (19). Gender may also play a role in the regulation of eNOS activity via estrogen, because NO production is higher in healthy premenopausal women compared with age-matched men (20). Accordingly, we sought to determine whether the functional G894→T eNOS gene polymorphism could be a determinant of the systemic and renal hemodynamic response to AngII and whether the association was dependent on gender. We hypothesized that the hemodynamic response to AngII would be augmented in individuals with the T allele and that this response would be greater in men than in women. Fifty healthy participants were enrolled in the study. All were white, normotensive, of reproductive age, and on no medications. Specifically, no female participants were using oral contraceptive medications. The participants were volunteer and responded to advertisements displayed at the University of Toronto for young white men and women, with no medical illnesses or medications, including oral contraceptives. No participants were smokers. All underwent a physical and laboratory examination performed by a qualified internist. For controlling confounding variables, all participants were counseled by a dietitian to observe a prescribed diet with a consistent intake of calories, sodium (150 to 200 mmol/d), and protein (1 to 1.5 g/kg per d). Compliance with diet was verified through a 24-h urine collection. Individuals were included in the study only when the sodium excretion rate was >2 mmol/kg per d and the urea excretion rate was between 3 and 6 mmol/kg per d. After an overnight fast, participants arrived at the renal physiology laboratory at 8:30 a.m. on the day of testing. They lay supine in a warm, quiet room during the assessment. This study was performed with the approval of the University of Toronto Human Subjects Review Committee. Documentation of informed consent was obtained from each participant. The study protocol was similar to that previously described (21). Once resting in a quiet room, participants were assessed over a period of 3 h. Serial systolic, diastolic, and mean arterial BP (SBP, DBP, and MAP, respectively), as well as heart rate, were obtained each half hour via an automated sphygmomanometer (Dinamapp; Critikon Co., Tampa, FL). Final BP results reflected the mean of five consecutive measurements. Participants voided immediately upon arrival and then drank sufficient water to induce a water diuresis. Thereafter, adequate spontaneous voiding was ensured throughout the assessment by ingestion of 200 ml/h water. An 18-gauge peripheral venous cannula was inserted into an antecubital vein for infusions of inulin, paraaminohippurate (PAH), and AngII (Clinalfa, Basel, Switzerland). A second catheter was inserted in the contralateral arm for blood sampling. The AngII infusion was prepared as described previously (21) and was infused at 4 ng/kg per min for 45 min. Participants remained supine except to void. Blood was collected once during the AngII infusion, and urine was collected at the end of the infusion. MAP was measured throughout and recorded midway through the infusion. Renal hemodynamic indices were measured using inulin and PAH clearance methods. After baseline blood samples were collected, a priming infusion that contained 25% inulin (60 mg/kg) and 20% PAH (8 mg/kg) was administered. Inulin and PAH then were infused continuously at a rate that maintained plasma concentrations of 20 and 1.5 mg/dl, respectively. After a 90-min equilibration period, three timed urine collections were obtained 20 min apart, and blood was collected for inulin and PAH levels, as well as for hematocrit (HCT). Blood samples collected for inulin and PAH levels were immediately centrifuged at 3000 rpm for 10 min at 4°C. With the samples kept on ice, the plasma was separated and then stored at −70°C before the assay. Inulin concentrations in plasma and urine were measured by a modified method of Walser et al. (22), and PAH concentration was determined by a spectrophotometric method according to Brun (23). The mean of the final two urinary excretion rates for inulin and PAH represented the GFR and effective renal plasma flow (ERPF) expressed per 1.73 m2, respectively. Filtration fraction (FF) was calculated as the ratio of GFR to RPF. Renal blood flow (RBF) was derived by dividing the ERPF by (1 − HCT). The MAP divided by the RBF yielded the renal vascular resistance (RVR). Serum sodium concentration was measured by an ion-selective electrode method, whereas urine sodium was measured by a flame photometry method. Blood collected for AngII levels was placed into precooled tubes that also contained EDTA and angiotensinase inhibitor (0.1 ml of Bestatin Solution; Buhlmann Laboratories, Basel, Switzerland). Samples were analyzed using a competitive RIA kit supplied by Buhlmann Laboratories. Genomic DNA was extracted from peripheral blood leukocytes as described previously (24). The DNA was resuspended in TE buffer (10 mmol/L Tris-HCl and 0.2 mmol/L sodium EDTA [pH 7.5]), and the concentration then was determined by spectrophotometry. For determining the eNOS genotype of each participant, 0.1 μg of genomic DNA was amplified by PCR. The 20-μl reaction mixture contained 2 μl of 10× KCl-containing PCR buffer (Qiagen, Valencia, CA); 0.8 μl of 25 mM MgCl2 solution; 1 μl each of the 10-μM sense and antisense primers; 3.2 μl of 1.25 mM deoxy-nucleotide triphosphates, specifically deoxy-adenosine triphosphate, guanosine triphosphate, cytosine triphosphate, and thymidine triphosphate; and 2.5 U of TaqDNA polymerase. Thirty-four cycles of PCR were performed: 30 s at 94°C, 30 s at 61°C, and 30 s at 71°C. The primer sequences were as follows: 5′-TCC CTG AGG AGG GCA TGA GGC T-3′ and 5′-TGA GGG TCA CAC AGG TTC CT-3′ (25). This PCR amplification yielded a 457-bp product from which unused deoxy-nucleotide triphosphates and primers were separated using a commercial filtration system (Microcon-PCR Filter Units; Millipore, Bedford, MA). The purified PCR products then were reconstituted in 20 μl of distilled water and subjected to overnight incubation at 37°C with 7.5 U of the restriction endonuclease BanII (New England Biolabs, Beverly, MA). The 894G allele of the eNOS gene contains a recognition site for BanII such that digestion of the 457 bp amplicon with the endonuclease yielded two fragments of 320 and 137 bp each. The change to T at the 894 position disrupts the recognition sequence such that the original 457-bp amplicon remains unaltered after incubation with BanII. The digestion products were separated using 2% agarose gel electrophoresis and stained in ethidium bromide. Assignment of genotype was confirmed in a subset of participants, and results were duplicated with no errors in original assignment. In addition, all PCR amplifications, restriction enzyme digestions, and electrophoresis gels were run on a control sample that consisted of a known heterozygote for the allele. Comparisons between groups of baseline parameters were made using nonparametric methods (Wilcoxon rank sums). P ≤ 0.05 was designated to represent statistical significance. The data were analyzed using a multivariate linear regression to determine the relationship among renal hemodynamic function, gender, and genotype. Furthermore, participants were divided into four groups on the basis of gender and the presence or absence of the T allele (GG versus GT/TT). Data are presented as mean ± SEM. Gender and genotype were designated categorical variables, whereas BP and renal parameters were considered continuous variables. Differences in hemodynamic function among the four groups then were analyzed using ANCOVA. By constructing a model that incorporated gender, genotype, and an interaction term of the two variables (gender and genotype), the relation of these factors to BP and renal hemodynamic function was assessed. The differential effect of gender and genotype was analyzed using least square means procedures. The differences in systemic and renal hemodynamic responses to AngII were analyzed again using ANCOVA to examine the relationship among gender, genotype, and the hemodynamic responses. All statistical analyses were performed using the statistical package SAS (SAS Institute Inc., Cary, NC). Fifty participants (24 women and 26 men) were recruited and divided into four groups on the basis of gender and the eNOS gene G894→T polymorphism. The gene frequencies for the study group as a whole were 0.59 (G allele) and 0.41 (T allele). The genotype frequencies in the group did not differ significantly from a Hardy Weinberg distribution (χ2 = 0.12, P = 0.94). The distribution of the T allele was found to be similar in both genders. The baseline characteristics of the study participants are shown in Table 1. As expected, mean values for body mass index and HCT were greater in men than in age-matched women. Twenty-four-hour urine sodium and urea excretion rates, expressed as mmol/kg per d, did not differ between the groups (data not shown). At baseline, male participants had significantly higher mean values for SBP than did female participants regardless of genotype, although all SBP measurements in both gender groups were <130 mmHg (Table 2). There was no association between BP and the eNOS gene G894→T polymorphism in either male or female participants. In the multivariate linear regression model, gender and genotype were significant predictors of baseline GFR, ERPF, and RBF (P = 0.003). After stratification and analysis using ANCOVA, there was an association between the eNOS gene G894→T polymorphism and baseline renal function, and the association was gender dependent (Table 3). Male participants with the GT/TT genotype had significantly lower mean values for GFR, ERPF, and RBF (P = 0.03) than men with the GG genotype. Although RVR tended to be greater in men with the T allele, the difference did not reach statistical significance. This association was not observed in the female participants. In addition, men with the GT/TT genotype had significantly lower values for RVR and FF than did women of the same genotype (P = 0.05). The BP responses to the administration of AngII in the four groups of participants are shown in Table 4. There was a trend toward greater increases in SBP in both male and female participants with the GT/TT genotype compared with participants with the GG genotype, but the differences did not reach statistical significance. A similar trend was observed for DBP and MAP in the male participants. Multivariate linear regression analysis revealed that gender (P = 0.03), genotype (P = 0.009), and the interaction term gender * genotype (P = 0.03) were significant predictors of the GFR response to AngII. The renal hemodynamic responses to AngII in the four groups, as assessed by ANCOVA, are shown in Table 5. There were statistically significant differences in the change in GFR in response to AngII in men when divided by genotype but not in women. Men with the GT/TT genotype exhibited a decrease in GFR, whereas men with the GG genotype exhibited an increase in GFR (P = 0.04). 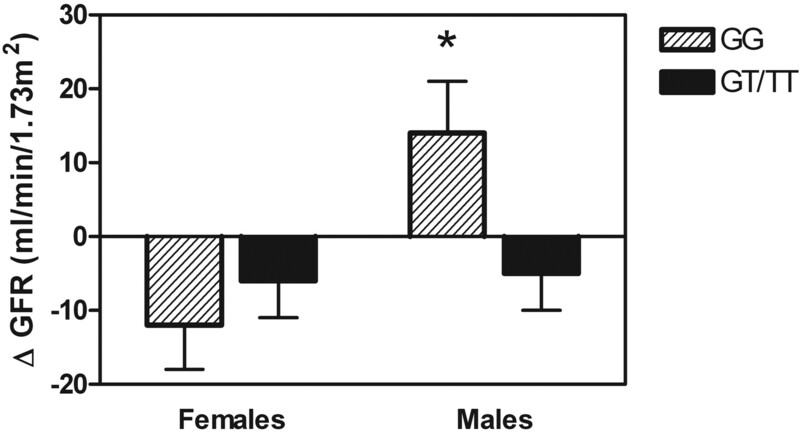 This difference in response on the basis of genotype was not observed in the female participants (Figure 1). Mean values for GFR declined in both groups of female participants after the infusion of AngII. ANCOVA revealed a significant interaction between gender and genotype in predicting the change in both GFR and FF in response to infusion of AngII (P = 0.047 and 0.023, respectively). Response of GFR to angiotensin II infusion in female and male participants segregated according to endothelial nitric oxide synthase gene G894→T polymorphism. *P < 0.05 versus response of GT/TT men. The goal of this study was to test the hypothesis that there is an association between the eNOS gene G894→T polymorphism and the systemic and renal hemodynamic responses to the vasoconstrictor AngII in young, healthy, normotensive individuals and, furthermore, to determine whether this interaction varied with gender. This particular variation in the eNOS gene was selected for study as it has been demonstrated to be a functional polymorphism. The single base change leads to a conservative substitution of aspartate for glutamate at position 298 of the eNOS protein, rendering it vulnerable to proteolytic cleavage and potentially altered eNOS enzyme levels and stability. Furthermore, this polymorphism has been associated with increased systemic vascular tone in human studies (11) and has variably been linked with hypertension (26–28). Of note, the eNOS gene G894→T polymorphism has been associated with vascular responsiveness in the coronary circulation (29,30), with pre-eclampsia (31), and,recently, with the development of renal artery atherosclerosis (32). Gender is an important determinant of BP (33), and the response to AngII and genotypic influences on hemodynamic function have been shown to be gender dependent (19). Our first major observation was that the eNOS gene G894→T polymorphism alters baseline renal hemodynamic function, and this influence is gender dependent. Men with at least one copy of the T allele (GT and TT) exhibited lower values for GFR and ERPF than did the men who were homozygous for the G allele; however, this phenomenon was not observed in women. This association was not a function of differences in perfusion pressure because mean values for SBP, DBP, and MAP were similar in the two groups of male participants. However, a trend toward increased RVR in GT/TT men compared with the GG men may indicate a difference in eNOS-influenced renal vascular tone, although the exact mechanism responsible for the association between the eNOS gene G894→T polymorphism and altered baseline renal hemodynamic function was not determined in our study. Administration of the competitive NOS inhibitor, l-NMMA, is known to increase intrarenal vascular resistance and lower ERPF and GFR in rats and humans (34–36). The finding that the influence of this polymorphism on renal hemodynamics is gender dependent may be related to differences in estrogen levels in men and women. NO production has been shown to vary according to fluctuations in estrogen levels (20,37). NO activity has also been shown to be influenced by estrogen, including induction of calcium-induced eNOS activation, and posttranslational modifications of eNOS via the activation of the signaling molecule Akt by 17β-estradiol (38–41). Taken together, the above studies support the hypothesis that the association that we observed could have been a consequence of reduced renal vascular production of NO in men with at least one copy of the T allele compared with those who were homozygous for the G allele, related to differences in genotype as well as estrogen levels. Our second major observation was an association between the eNOS gene G894→T polymorphism and differences in renal hemodynamic response to AngII infusion. Men with the GT/TT genotype exhibited a decrease in GFR in response to AngII; in contrast, mean values for GFR rose in men with the GG genotype and remained unchanged in women of either genotype. Given that the baseline values for RVR tended to be higher in the GT/TT group and because the presence of the T allele has been shown to correlate with decreased NO activity, the decline in GFR might reflect the greater unopposed effect of AngII in the GT/TT group when compared with the GG group. Typically, AngII would induce the compensatory production of vasodilators, including NO, through selective stimulation of AT2 receptors in the afferent arteriole, thereby offsetting the vasoconstrictor response (42). Although the mechanisms responsible for the observed gender and genotypic differences in AngII responsiveness are not revealed by this study, men with the GT/TT genotype might have been more susceptible to an AngII–induced decrease in GFR because of the functional nature of the G894→T polymorphism. The decrease in GFR, however, was not accompanied by a greater decline in ERPF in men with the GT/TT genotype as compared with those with the GG genotype. A possible relationship between the RAS and genotypic variants in the NO system is an important consideration given that AngII plays a significant role in the pathophysiology of progressive kidney disease through its renal vascular effects and its direct cellular effects that influence cell proliferation and hypertrophy and promote fibrosis and inflammation (18,43,44). NO not only opposes the vasomotor effects of AngII but also inhibits leukocyte and platelet aggregation and smooth muscle hypertrophy (45). Furthermore, the potentially harmful effects of AngII that contribute to renal disease may be influenced by gender, as suggested by studies by Silbiger and Neugarten (46,47), which indicate that the rate of progression of kidney diseases is accelerated in men compared with women. A gender-related difference in baseline BP was observed in our study of young, healthy, normotensive adults; men had consistently higher BP values than did women, regardless of whether they were in the GG or GT/TT genotype group. This finding is in keeping with literature that indicates that men maintain higher BP than women until well past the time when women reach menopause (33). The interaction among gender, the eNOS gene G894→T polymorphism, and baseline renal hemodynamic function and response to AngII may extend to the systemic circulation. Overall, a trend toward an augmented systemic hemodynamic response to AngII infusion was noted in participants with the GT/TT genotype compared with those with the GG genotype, particularly in men, although these results did not reach statistical significance, perhaps related to sample size constraints. In accordance with this observation, the eNOS gene G894→T polymorphism has been associated with hypertension in some, although not all, studies (26–28). The effect of the T allele on NO production is thought to be dose dependent, with a 40% reduction in NO in GT heterozygotes and an 80% reduction in TT homozygotes (7). Miyamoto et al. (15) has reported that hypertensive individuals have lower basal NO production and are more commonly carriers of the 894T allele of the eNOS gene. However, there is no clear consensus as to whether possession of the T allele alone correlates with vascular dysfunction in otherwise healthy, young individuals (48,49). An association between the T allele and the systemic vascular response to a vasoconstrictor has also been reported. For example, Philip et al. (50) documented greater increases in MAP in patients with at least one copy of the T allele in response to the vasoconstrictor phenylephrine administered during cardiopulmonary bypass. Taken together with our observations of a trend toward enhanced responsiveness to AngII in the presence of a T allele, these studies suggest that the eNOS gene G894→T polymorphism may be an important determinant of the systemic BP responses to vasoconstrictor agents. It is possible that the T allele is associated with vascular dysfunction only when combined with a second cardiovascular risk factor. In this regard, studies have reported associations between the G894→T polymorphism and smoking or other eNOS polymorphisms and altered vascular responsiveness (7,12,51). Combining the eNOS gene G894→T polymorphism with a second risk factor results in decreased flow-mediated arterial dilation, a well-established experimental marker of endothelial dysfunction and predictor of cardiovascular disease. It could be hypothesized that possession of the T allele leads to impaired basal NO production in the vasculature but that this effect is insufficient to influence systemic vascular tone unless there are additional vasoconstrictor influences. Reports have suggested that the eNOS gene G894→T polymorphism is a risk factor for end-stage renal failure or renal disease progression, and our hemodynamic observations provide a potential mechanistic link between these population studies and the gene polymorphism (17,52,53). Our data also suggest that the relationship may be based on BP and the renal hemodynamic response to AngII, similar to previous reports in patients with coronary artery disease, pre-eclampsia, and coronary artery vasospasm (2,14,25). There are a number of limitations to our study. An important limitation was the relatively small number of participants. This concern related particularly to the effect of gender, and it is possible that the significant result was a chance effect. As well, the gender-dependent associations that we observed between renal hemodynamic function and the eNOS gene G894→T polymorphism may not be a consequence of the functional nature of the polymorphism. In addition, because our study was limited to young, healthy, white individual, the findings may not be generalized to a population of mixed ethnicity. This is especially true given the considerable variability between the association of the T allele and cardiovascular disease in other ethnic groups (54). Age and pre-existing cardiovascular disease may also have an impact on the systemic and renal hemodynamic responses to AngII and their interactions with the eNOS gene G894→T polymorphism. Age and menopausal status may also be particularly important in women because of the effect of estrogen on eNOS activity. In summary, we conclude that the eNOS gene G894→T polymorphism is a determinant of baseline renal hemodynamic function in young, healthy individuals. Moreover, there is an interaction among the eNOS gene G894→T polymorphism, gender, and baseline renal function. In addition, the eNOS gene G894→T polymorphism is associated with the renal and possibly the systemic hemodynamic response to AngII in a gender-dependent manner. These effects may account, at least in part, for the association between the eNOS gene G894→T polymorphism and clinical states including coronary artery disease and end-stage renal failure. This work was previously published in abstract form (J Am Soc Nephrol 15: 48A, 2004) and presented at the meeting of the American Society of Nephrology, October 29 to November 1, 2004, St. Louis, MO. This work was supported by a New Emerging Team grant from the Canadian Institutes of Health Research (to D.C.C, J.W.S., and J.A.M. ), The Physicians' Services Foundation Inc. (to J.A.M. and D.C.C. ), and the Heart and Stroke Foundation of Canada (to J.A.M.) grant NA 5008. We acknowledge equal contributions by J.A.M. and J.W.S. We also thank Dr. Charmaine Lok for review of the manuscript and assistance with the statistical analysis. We also acknowledge Clinalfa for providing angiotensin II and paraaminohippurate for these experiments.